According to a new research report published by Transparency Market Research, the global osteoporosis drugs market was valued at US$8.4 billion in 2013 and is expected to be valued at US$8.9 billion by 2020. The global osteoporosis drugs market is forecast to grow at a 1.2% CAGR during the forecast period. The report, titled ‘Osteoporosis Drugs Market - Global Industry Analysis, Pipeline Analysis, Size, Share, Growth, Trends & Forecast 2014 - 2020’, states that the global osteoporosis drugs market is positioned to grow faster in the coming years due to increased occurrences of osteoporosis. The global osteoporosis drugs market is segmented on the basis of geography and drug classes. Osteoporosis is a well-known bone disorder, wherein the bone mass is worn out, leading to changes in the bone’s microstructure. Osteoporosis increases the chances of bone fractures and bone cracks. The demand for osteoporosis drugs has increased in the recent past due to increase in the number of people suffering from this bone disorder. By geography, the global osteoporosis drugs market is segmented into North America, Asia Pacific, Europe, and Rest of the World. Rising prevalence of osteoporosis in all areas of North America has led to growth of the osteoporosis drugs market in this region. Thus, by geography, the North America regional market will dominate the global osteoporosis drugs market during the forecast period. The global osteoporosis drugs market is dominated by a few major players. Leading companies introduce effective osteoporosis drugs to cure the bone disorder. Some of the major companies in the global osteoporosis drugs market are Actavis plc, Eli Lilly and Company, Merck and Company Inc., Teva Pharmaceutical Industries Ltd., Amgen Inc., F. Hoffmann La Roche Ltd., and Novartis International AG. By drug class, the global osteoporosis drugs market is segmented into calcitonin, parathyroid hormone therapy, bisphosphonates, selective estrogen receptor modulators, RANK ligand inhibitors, and others. The global osteoporosis drugs market is segmented on the basis of drugs by considering factors such as geographic presence, patents, global effect of sales of particular drugs, therapeutic application, and drugs in pipeline. By drug class, bisphosphonates are expected to lead the global osteoporosis drugs market during the forecast period. 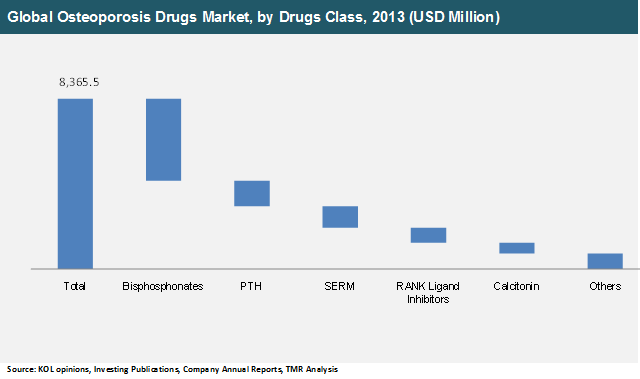 In 2013, bisphosphonates were the largest market segment, accounting for 48.2% of the market. The market is mainly driven by the rise of generic products. PHT and RANK Ligand Inhibitors are considered to be the important contributors in the global osteoporosis drugs market. The pipeline drugs segment is expected to be the fastest growing segment during the forecast period. The pipeline drugs segment is forecast to grow at a 125.2% CAGR for the period between 2014 and 2020.